Once upon a time (actually, twice up a time) the St. Louis Cardinals met the Boston Red Sox in the World Series and the right team won. The first of those match-ups was in 1946. That season was Stan Musial’s first back following his military service in 1945, and all he did in 1946 was hit .365/.434/.587 with 228 hits including 50 doubles, 20 triples and 16 home runs to be named National League MVP and lead the Cardinals to their fourth pennant in five years. And, since seeing is always better, check out this 1946 World Series highlight video, including Harry Walker describing his double that drove in Slaughter. Yes, there was an obstruction call then too — along with a much happier Series ending, just like there was in 1967 as well. 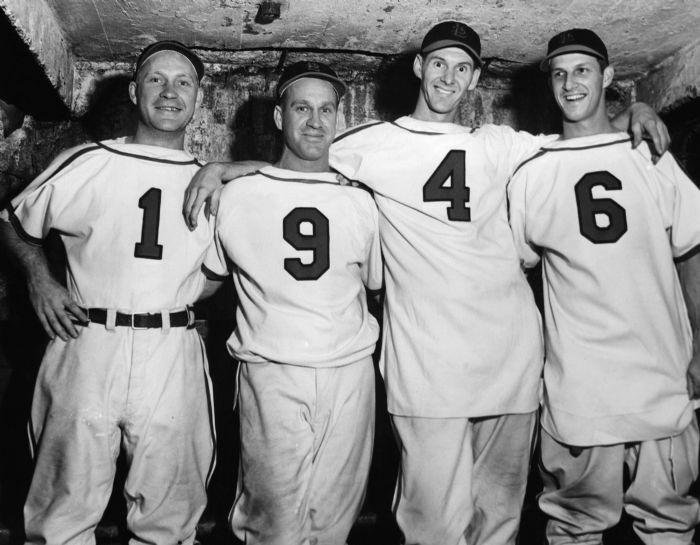 This entry was posted in General Cardinals and tagged 1946, Enos Slaughter, Harry Walker, Stan Musial, Throwback Thursday, World Series by Christine Coleman. Bookmark the permalink.